It could have been an infuriating experience. And then, suddenly, a Nigerien sales clerk transformed the moment into something entirely different. 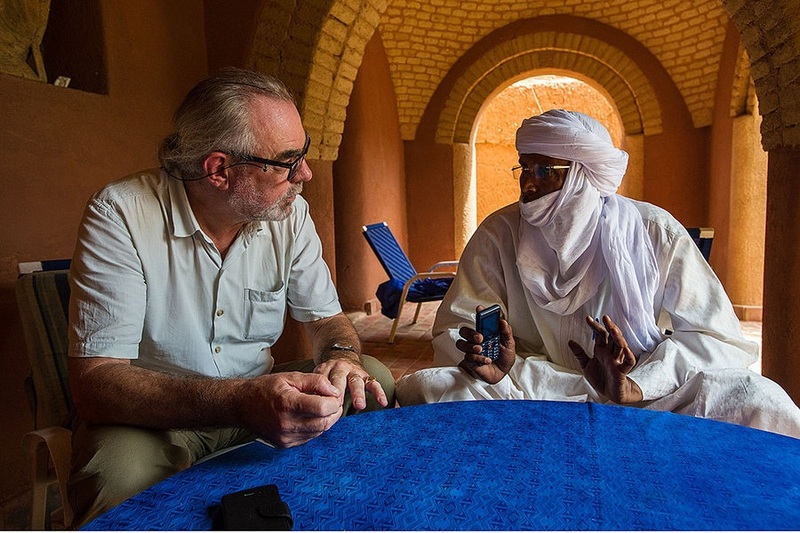 It all began in Agadez, the remote mud-walled town in Niger that serves as the southern gateway to the Sahara desert. I had been reporting there for several days with my colleague, Scott Peterson, and we were packed at dawn to take the Niger Airlines prop plane back to the capital, Niamey, and catch connecting homeward flights to Europe. But the airport was closed. A US Air Force Globemaster III transport plane (bringing goods to the US military’s anti-terrorist drone base under construction nearby) had broken down on the runway and closed it to all civilian traffic. Plenty of frustrated passengers at the Niger Airlines office in Agadez, their heads and faces swathed in Tuareg turbans, made no secret of what they thought about the mess the Americans had created. But that evening, the whole town heard the plane’s monstrous roar as it took off into the starlit sky, evidence that someone had figured out how to fix it. We had been told that Niger Airlines would pick up its stranded passengers the next morning. But HQ in Niamey decided to stick to its timetable, meaning the next flight out would not leave until Friday. Fortunately, we were able to plead our way onto a United Nations flight that afternoon to Niamey. And then we turned our attention to getting reimbursed for the unused return portion of our tickets. Which is what this story is all about. After we arrived at the airline’s dimly lit office, a young sales clerk assured us there would be no problem and went off to organize payment. But he returned to report that the agency had no cash on hand. He suggested we come back tomorrow, but we would be gone by then. The clerk left again, and this time returned with the finance director, who confirmed the lack of money in the office. The woman behind the cashier’s counter confirmed his statement by showing me her empty till. Writing a check was out of the question: The manager with authority to do so had left for the evening, and no one was going to risk calling him. Amid what was becoming an increasingly animated discussion, I had not noticed that the young man with whom I had originally spoken had slipped out of the office. Now he returned, with 150,000 West African CFA francs – more than two-thirds of what we were owed. As it turned out, he had borrowed it personally from a street stall-holder. He had explained his predicament and his determination to do right by us, and the stall-holder had fronted him all the money he had – the equivalent of about $260 – till the following day. I was floored. A lowly sales clerk had taken it upon himself to cut through all his office’s inefficiency with an act of initiative and generosity.